WASHINGTON (AP) — After an Oval Office sit-down on Tuesday did nothing to move Republican Senate leaders off their hard line against a Supreme Court nomination, Democrats pulled out another weapon in the heated election-year fight: Donald Trump. 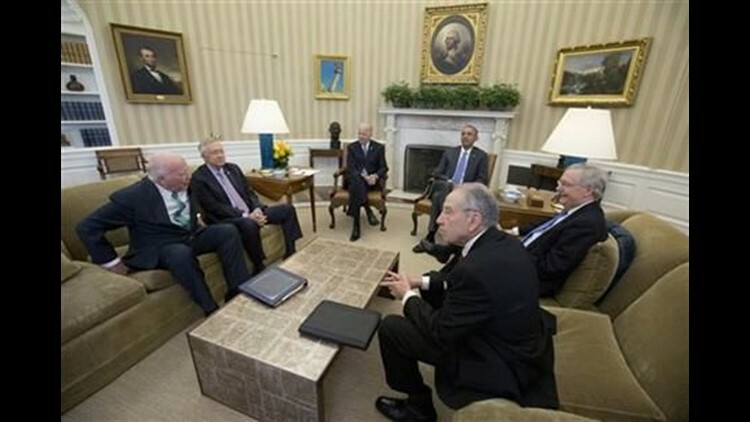 In a White House meeting that lasted less than an hour, Senate Majority Leader Mitch McConnell, R-Ky., and Judiciary Committee Chairman Chuck Grassley, R-Iowa, told President Barack Obama that any confirmation process during a presidential campaign would politicize the court. They offered up no potential candidates that would win their backing and no route to filling the seat. "This vacancy will not be filled this year," McConnell told reporters after the meeting. Democrats accused Republicans of trying to hold the seat open so that a Republican president can fill it. That president could be Trump, they noted, hoping to needle a GOP establishment uncomfortable with the prospects of Trump presidency. The meeting — which also included Vice President Joe Biden, Senate Minority Leader Harry Reid, Sen. Patrick Leahy, D-Vt., the ranking Democrat on the judiciary committee — was the first time the leaders have met since Justice Antonin Scalia's death last month set off a high-stakes clash over the Supreme Court vacancy. While the men huddled at the White House, voters in 12 states were preparing to weigh in on a presidential contest that has tanked Obama's chances of filling the seat — but also given Democrats a new line of attack. As they emerged from the meeting, they quickly linked the GOP strategy to the Republican front-runner poised to pick up significant momentum Tuesday night. "All we want them to do is fulfill their Constitutional duty and do their job, and at this stage, they decided not to do that," Reid said. "They think that they can wait and see what President Trump will do, I guess." Reid's comments were aimed at riling up Democrats, as well as moderate and establishment Republicans who cringe at the thought of the unpredictable celebrity candidate controlling the future of the court. It was an early sign that with formalities — such as awkward White House meetings — dispensed with, the fight over the court was largely a battle for public opinion. "Whether everybody in the meeting today wanted to admit it, we all know that considering a nomination in the middle of a heated presidential campaign is bad for the nominee, bad for the court, bad for the process, and ultimately bad for the nation," Grassley said in his statement about the meeting. "It's time for the people to voice their opinion about the role of the Supreme Court in our constitutional system of government." At another time, the gathering might have been a nod to the tradition of at least limited cooperation in naming and confirming justices to the nation's highest court. The president might have floated potential candidates; Senate opposition might have come armed with their own preferred names. On Tuesday, neither side came with much more than talking points. Obama laid out his thinking on his nominee search and offered to consider any suggestions for candidates, White House spokesman Josh Earnest said. Republicans did not offer any, Reid said, who added that with little else to discuss the leaders chatted about basketball. Republicans maintain the choice of nominee is irrelevant; their objection is to the timing. At a private meeting of House Republicans before heading to the White House, McConnell promised not to budge from that stance, even as the campaign heats up. Several of those in attendance said he used the phrase "Read my lips," made famous by President George H.W. Bush when he promised during his 1988 campaign to not raise taxes — a promise he later abandoned under Democratic pressure. While the standoff continues, the president has been reading through files on potential nominees and considering his options. The White House says the president has not settled on a short list and could still add names to the mix. For now, the White House is focused on demonstrating that it is making an effort to consult with the Senate — even if there's not much give and take. "The president certainly has the constitutional authority to nominate a justice in an election year, and he intends to use it," Grassley wrote in an op-ed in the Des Moines Register published Tuesday. "In the Senate, we have the equal constitutional authority to consent or withhold consent." Associated Press writers Alan Fram and Donna Cassata contributed to this report.